Our Y-Splitter upgrade and additional hose is perfect for pet owners looking to add mist / humidity to two enclosures using one Evergreen Pet Supplies reptile humidifier / reptile fogger. Compatible with vivariums, tanks, cages, terrariums, vision cages, aquariums, reptariums, and plastic/PVC/glass cages. Package includes Y-Splitter and additional hose, only - no base or tank included. 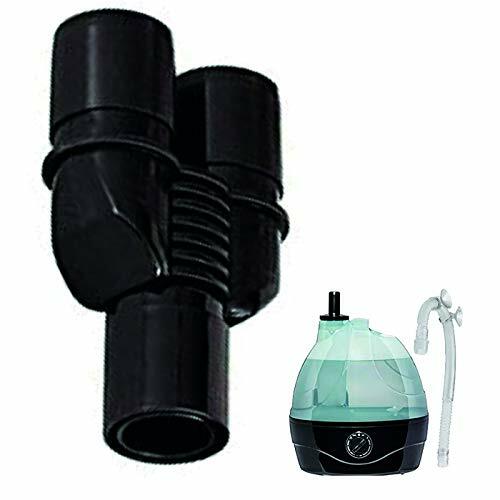 Simply disconnect your existing hose, insert the single hole of the Y-Splitter into the black plastic piece of the top of the tank, and then connect both hoses to the two holes of the Y-Splitter and you're ready to go. As with your existing system, please use only distilled water for maximum system lifetime. Best used along with a hygrotherm or timer to provide a rest period for the reptile humidifier. PLEASE NOTE: Does not work with other humidifiers / foggers - only with Evergreen pet Supplies reptile humidifier / reptile fogger.